Iowa really should be better. Not only is Aaron White having an All-Big Ten caliber season, but he has solid frontcourt running mates in Gabe Olaseni and Jarrod Uthoff. The backcourt will not be confused with Notre Dame's anytime soon, but offensively at least Mike Gesell and Peter Jok rank well above-average in the Big Ten (take note—this is something like damning with faint praise. As the backcourts of Michigan & Illinois have not exactly worked out as planned, guardplay is the a primary reason why the Midwestern conference is down this season). And Adam Woodbury—when he isn't running his hack-a-thon camp—has been serviceable in conference play. 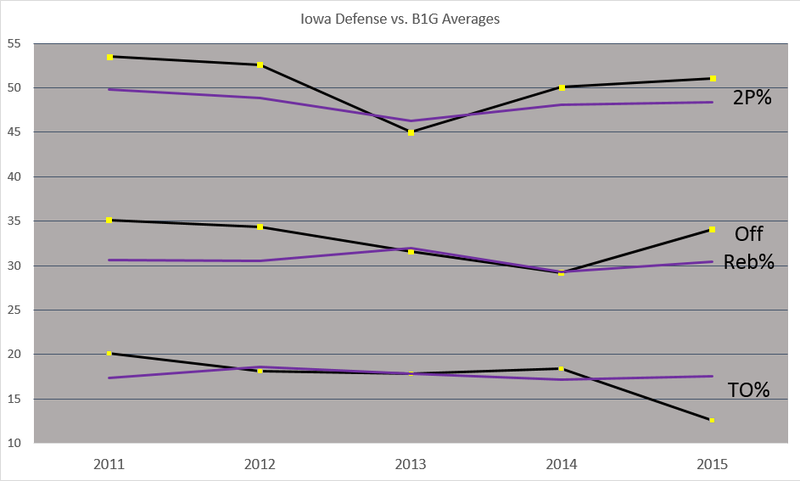 The purple represents the conference averages over the span of McCaffrey's tenure at Iowa. As you can see, there's one season that really stands out (2013), but I honestly have no idea why. The two-point defense was especially improved, but I'm unable to come up with a reason why subbing out Bryce Cartwright and Matt Gatens for Woodbury and Olaseni can hurt one's interior defense. Indeed, the presence of tall guys willing to block shots can (and probably does) explain why Iowa has never been particularly good at forcing turnovers ever since the tall guys started arriving in 2012. But it's worth noting that Iowa has always ranked 3rd or 4th in the percentage of opponent two-point shots blocked. Ditto for defensive rebounding. The team has enough athleticism to be elite on the boards at the other end of the floor, so it has to be something other than frontline personnel. Indeed, if you go back to McCaffrey's later Siena teams, you see a similar issues if you are looking for it. Prior to the 2008-09 season, McCaffrey had a couple of very good defenses fueled by turnovers. Those teams were quick, pressing, and didn't block many shots. In other words, they look nothing like what Iowa looks like today. In 2008-09, that began to change. The team blocked more shots, got fewer steals, and generally started this strange mix of bad 2P defense with solid shotblocking. The defensive rebounding also did not go all that well...at first. The next season, Ryan Rossiter was on the court all the time, and rebounding at DeJuan Blair levels. Indeed, even after McCaffrey left, and just about everything went south under the new regime, the defensive rebounding stayed solid with Rossiter in the paint. After he left, that slipped too. Iowa's not good at very much on defense. They're dead last in defensive efficiency in Big Ten play. As long as the two-point defense is a mess, the ceiling on this unit is mediocrity. But in order to get there, the Hawkeyes need to rebound with the same fervor on defense that they do on the other side of the court. McCaffrey needs a new Rossiter.